Retractable washing lines are growing in popularity, as more and more people realise how much more convenient they are than standard clothes lines. 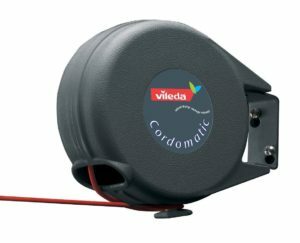 Which is why you’ll find this list very helpful when choosing the best retractable washing line. 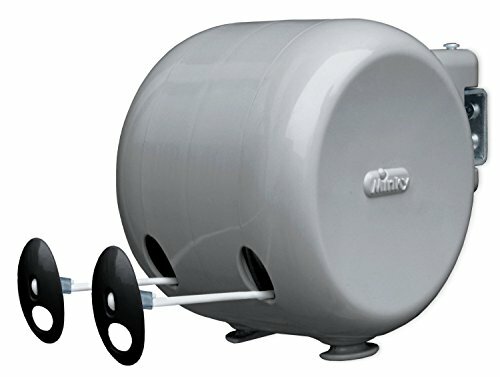 This Minky Retractable washing line features two lines that are 15 meters long each. That gives you 30 meters of drying space, more than enough for all your clothes. Impressively, the PVC lines are coated so that it can withstand the elements. It also requires no drilling to attach to the wall. 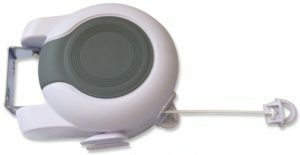 It attaches to the wall using a bracket and simply clicks on and off for easy removal and storage. A major advantage of this washing line is that it is very inexpensive and still of high quality. The only downside of this line is that it works best outside, so if it is rainy out you’ll have to wait to dry your clothes. However, this is pretty common among washing lines so it isn’t really a big deal. This retractable washing line from Brabantia is a sleek, wall-mounted retractable washing line that works great anywhere. The first thing you’ll notice is how easy it is to open and close; you can do it with one hand. It is also very durable and can hold up to a whole load of laundry. This means you don’t have to worry about the line collapsing and snapping. This Brabantia retractable washing line is also very easy to install since it comes with easy to follow instructions. So you won’t have to waste your whole afternoon trying to set it up. It also comes with a five year guarantee to give you peace of mind. The only downside is that this retractable line is a little pricey. But you’ll find that it is definitely worth the money. This retractable clothes line has seemingly endless features that you’ll love. The first of which being its durability. It is made of very strong plastic that you’ll love. And since it is made of plastic, it is very inexpensive, without sparing any of its quality. It also has plenty of drying space, not as much as the Minky one, but with 15 meters, it’s still plenty for you to dry your clothes on. And lastly, this retractable clothes line is mounted to the wall easily and can be used indoor or out, making it easy to use even on rainy days. A feature unique to this clothes line that you’re sure to love, is its red line. The red line makes it very easy to see so you won’t be grabbing the air and looking foolish trying to find the line. A possible drawback of this line is that the line does not have a steel core, but you’ll find that this does not hinder its performance. It is actually necessary for it to not have to steel core so that you can tie it off at any length you please. 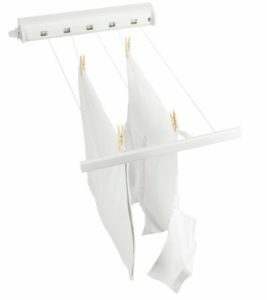 Another great clothes line, this one from Dryzem features two 15 meter retractable lines that are easily and conveniently stored in the housing unit when not in use. 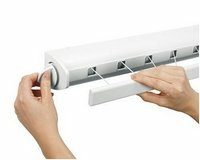 The housing unit itself is also adjustable and can be moved from side to side and stored against whatever wall you choose to hang it on. Lastly, this drying line has an automatic retraction mechanism that allows you to retract the line with the push of a single button and a cap to keep dirt out of the housing unit and off of the line. Luckily for you, this line is super easy to install and comes with very easy to follow instructions and everything you need to set it up. However, unfortunately for you, if you put too many clothes on it, it may bend a little and droop. It still holds a lot of clothes though, while still staying taut. Just don’t try to put an absurd amount of clothes on it. Another great washing line from Brabantia, this one’s sure to please, as one of the best retractable washing lines. It is compact and its simple design makes it easy to use. It has five drying lines and 22 meters of total drying space. This one is best used inside and can be stored compactly when not in use. It is very easily to install and the line are easy to pull out and retract. This washing line is also very budget friendly and won’t break the bank. A major advantage of this washing line is its durability. The lines are extra strong and always taut, so it won’t droop and let your clothes touch the ground. Like the other Brabantia washing line, this one also comes with a 5-year guarantee so it is totally risk-free. The only drawback is that it cannot be used outdoors, but this is one of the few washing lines that works fantastically inside.